Background: Simulation is a realistic representation of real-world dynamics or processes that reflect or parallel patient scenarios. Simulation-based medical education enables knowledge, skills and attitudes to be acquired by all health-care professionals. It has been widely adopted as a training and assessment tool in medical education. The aim of the study was to compare simulation-based versus apprenticeship-based teaching-learning tool on patient. Patients and Methods: In this prospective randomised interventional study, 30 interns were randomly assigned to perform laryngoscopy and endotracheal intubations (L and EI) on patients (Group 1) or on an airway mannequin (Group 2) up to 5 times over 3 successive days. Following this, all interns regardless of their group allocation performed up to 10 intubations on patients. They were assessed and scored by two observers using a rating scale and every attempt scored as 'Success' (1 point) or 'Failure' (0 point). Average scores of intubations of two groups were compared using the paired t-test. Results: Average scores of intubations on 10 patients by two independent observers were 6.220 (standard deviation [SD] 1.1428) in Group 1 and 7.147 (SD 0.6520) in Group 2 and 6.307 (SD 1.1317) in Group 1 and 7.193 (SD 0.6170) in Group 2, respectively (P = 0.012 and 0.014 for Observers A and B, respectively). 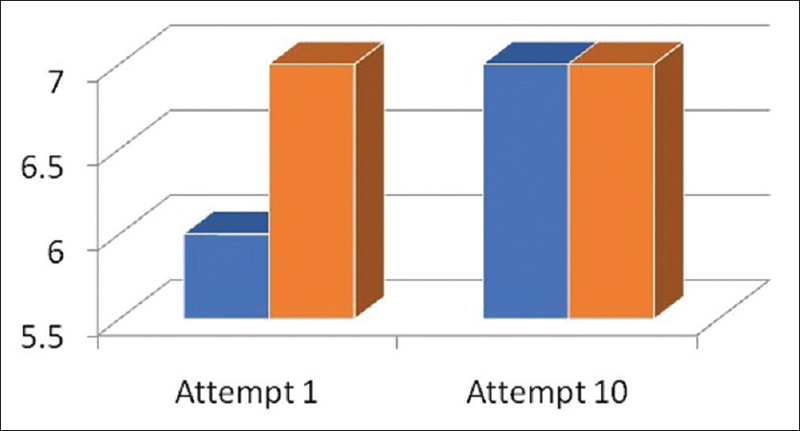 The score of attempt 1 and attempt 10 was observed by a single observer between groups, and significant difference (P = 0.021) was found at attempt 1 between groups with the mannequin group scoring better. At attempt 10, there was no significant difference between the groups. Conclusion: The mannequin group acquired better skills in airway management with respect to L and EI. Context: Morphological characteristics of the airway in a population have regional variations making airway assessment and management a crucial aspect of anaesthesia practice. Aims: (1) To determine the incidence of difficult laryngoscopy and intubation using Cormack–Lehane grading and Intubation Difficulty Scale (IDS). (2) To assess the accuracy of bedside clinical tests in predicting difficult laryngoscopy and intubation. Settings and Design: Prospective observational study was carried out on 200 patients aged 18–70 years, undergoing planned surgical procedures under general anaesthesia requiring endotracheal intubation. Pregnant women, patients with head-and-neck pathology, and patients with trauma were excluded from the study. Patients and Methods: All patients underwent preoperative airway assessment and standard induction procedure. Cormack–Lehane grading was noted during first laryngoscopy and process of intubation evaluated by IDS. Statistical Analysis Used: Descriptive statistics used to depict baseline profile. Chi-square, Student t-test and logistic regression used to determine adjusted effects. Analysis was performed using STATA (14.2). Results: The incidence of difficult laryngoscopy was 15.5% and difficult intubation was 12.5%. Univariate analysis showed body mass index (BMI) >25 kg/m2, neck circumference (NC) >36 cm and modified Mallampati score 3/4 as significant predictors. Logistic regression showed interincisor gap (IIG) (P < 0.001) and NC (P < 0.001) as significant predictors. Conclusions: NC and IIG are rapid, simple bedside tests to predict difficult intubation. Bedside clinical tests have poor discriminative power but still have a role in choosing alternative methods for airway management, making judicious use of time and resources while causing minimum discomfort to the patient. Background and Aims: Post-operative sore throat (POST) after general anaesthesia has been ranked as the eighth most important problem of the current clinical anaesthesiology. In comparison to endotracheal intubation, use of the laryngeal mask airway (LMA) has reduced the incidence of POST but has not been able to completely eliminate it. The aim of this study was to compare the efficacy of viscous lignocaine versus ketamine gargle for the prevention of POST after classic LMA insertion. Patients and Methods: A total of 90 patients scheduled for surgery under general anaesthesia using classic LMA were randomised into two groups of 45 each; Group L (lignocaine) and Group K (ketamine). While patients in Group L received 30 mL of 2% lignocaine viscous gargle 10 min before anaesthesia, patients in Group K received 5% ketamine 1 mL (50 mg) diluted in 29 mL of water. 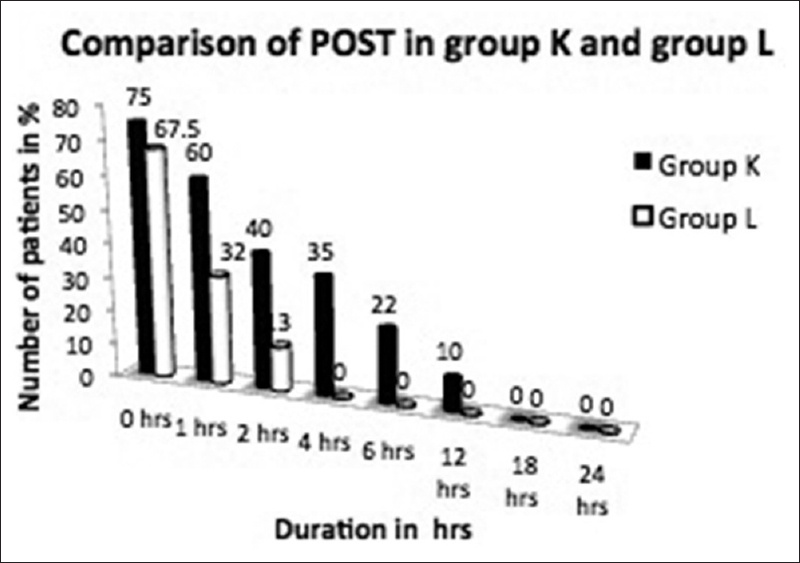 POST was graded at 0, 1, 2, 4, 6, 12, 18 and 24 h after operation on a 4-point scale (0–3). Statistical analysis was done using SPSS software version 16. All data were analysed for normal distribution using the Shapiro–Wilk test, categorical data by the Chi-square test and parametric data by Student's t-test. P < 0.05 was considered to be statistically significant. Results: Incidence as well as the severity of POST was significantly less in the lignocaine group (17.5% mild grade) in comparison to ketamine group (15% moderate grade and 25% mild grade). Conclusion: We conclude that compared to ketamine gargle, 2% lignocaine viscous gargle effectively reduces the incidence as well as the severity of POST following placement of classic LMA. 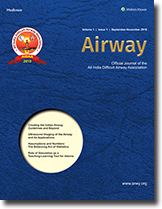 Airway ultrasound (US) provides a dynamic assessment of the airway. In conjunction with other imaging techniques such as computerised tomographic (CT) scan and magnetic resonance imaging (MRI), ultrasonography of the airway can influence airway management decisions. There is some evidence to support its use in the prediction of difficult airway by measuring pre-tracheal soft-tissue thickness and pre-epiglottis space thickness. 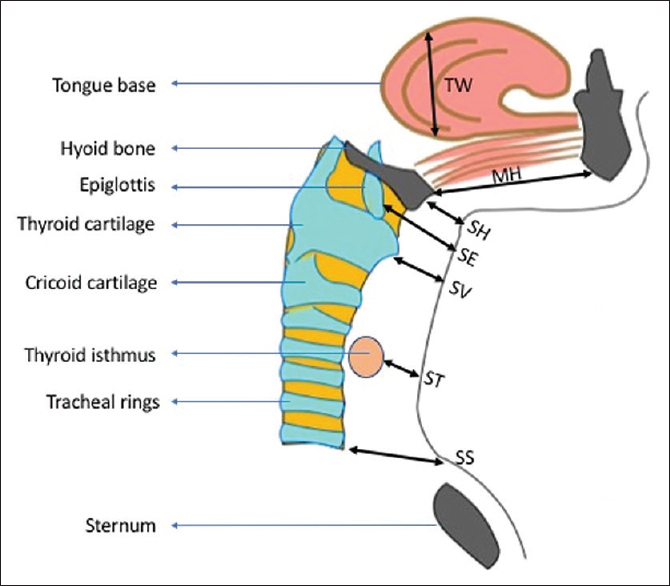 However, the dynamic scan of vocal cord movements may replace direct visualisation techniques in the future. In addition, measurements of the subglottic diameter by US have been shown to predict endotracheal tube size as accurately as MRI or CT scan. US-assisted or US-guided front of the neck procedures such as percutaneous dilatational tracheostomy is safer and more accurate with decreased rate of complications. 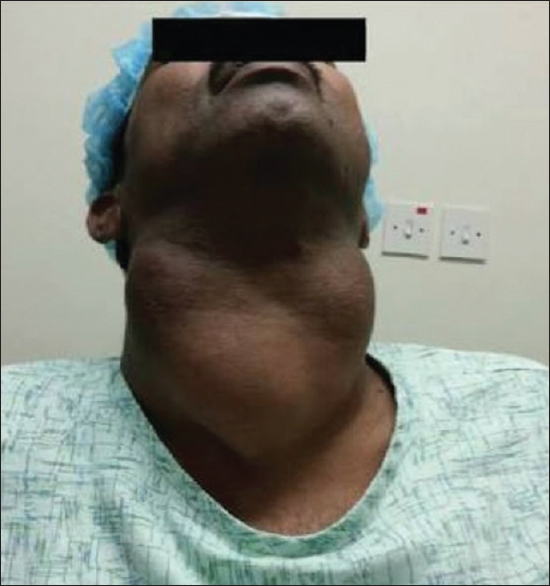 Localisation of cricothyroid membrane with US in difficult necks may become a life-saving procedure when complete ventilation failure is encountered. The use of US to overcome airway challenges is growing at a rapid pace adding newer dimensions to its use. 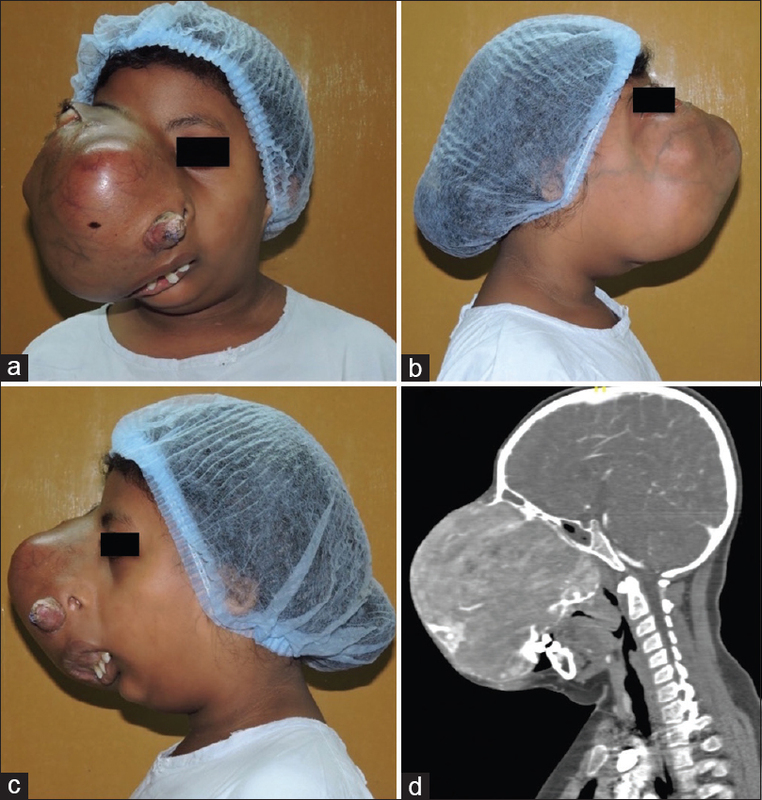 Fibrous dysplasia of the maxilla is a benign condition which presents as gross facial deformity and poses a great challenge to anaesthesiologists. The primary anaesthetic concern is difficult mask ventilation which requires a tailor-made approach for securing the airway, particularly in paediatric patients. Herewith, we report the successful airway management of a case of impossible mask ventilation in a paediatric patient with fibrous dysplasia of the maxilla using ProSeal™ laryngeal mask airway and C-MAC® videolaryngoscope. The intubating lightwand is a useful device for airway management in a patient with failed direct laryngoscopy or intubation. We believe this device is underutilised. We present a patient scheduled for thyroidectomy for a multinodular goitre extending into the mediastinum, encasing major vessels, and producing displacement of the larynx and trachea to the right. As tracheostomy was not feasible, we performed a lightwand-guided bougie-assisted oral intubation following a failed trial of awake direct laryngoscopy. 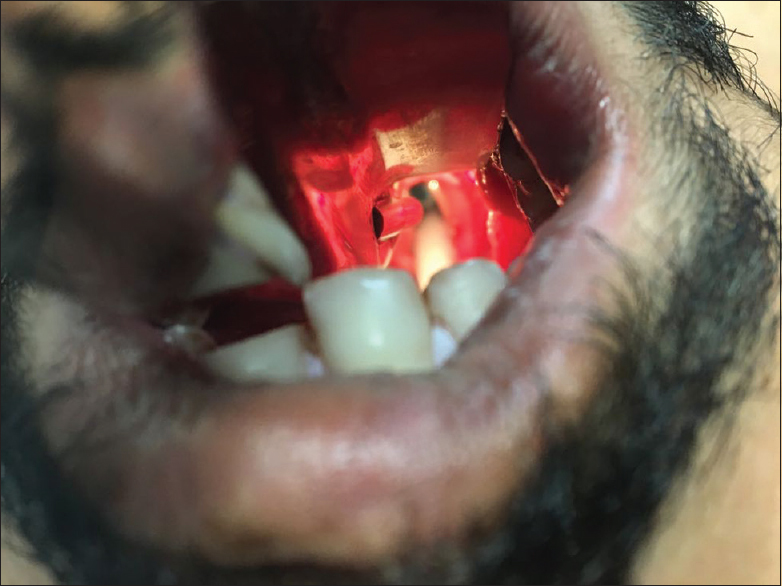 This report describes a case of failed ventilation in a patient who was intubated nasotracheally with a previously used ivory polyvinyl chloride nasal Ring–Adair–Elwyn (RAE) tube while undergoing general anaesthesia for mandibular surgery. This mishap occurred because of the mechanical U-shaped kinking of the tube below the vocal cords which was diagnosed with difficulty at laryngoscopy. On close inspection of the glottic opening at laryngoscopy, a U-shaped fold of the terminal end of the tracheal tube was observed. Reintubation with another fresh nasal RAE tube was followed by uneventful anaesthesia and surgery.